We’ve got another fantastic interview with comics legend Dan Jurgens on the latest episode of THE FIRE AND WATER PODCAST! 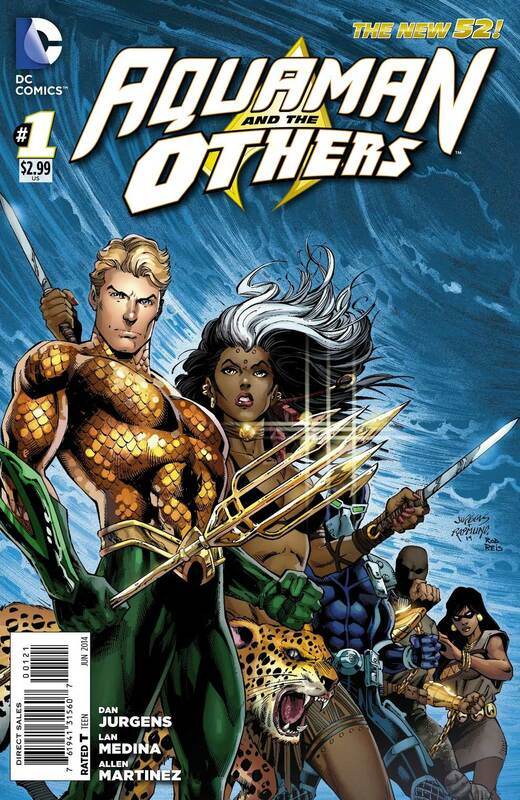 Dan is currently writing the ongoing series Aquaman & The Others, and is a contributing writer to the year-long weekly series The New 52 – Futures End featuring Firestorm! We discuss both of Dan’s current books as well as his previous series Fury of Firestorm. And just for fun we put Dan through another Lightning Round of questions! Be sure to pick up Aquaman & The Others #1 in stores now, and The New 52 – Futures End #0 absolutely free in stores on Free Comic Book Day (May 3)! You can find the 85th episode of THE FIRE AND WATER PODCAST on iTunes. While you’re there, please drop us a review on the iTunes page. Every comment helps! Alternatively, you may download the podcast by right-clicking here, choosing “Save Target/Link As”, and selecting a location on your computer to save the file (23 MB). For our previous interview with Dan, check out episode 33 of this show! Below you’ll find the Aquaman & The Others #1 variant cover by Dan Jurgens, as well as the cover to The New 52 – Futures End #1 by Ryan Sook. Click the images to enlarge! Thanks for listening! Support Firestorm and Aquaman (and Dan Jurgens)! Fan the Flame and Ride the Wave! Posted in: Comic books, Dan Jurgens, Firestorm #10: New 52 v2 (Ronnie/Jason), Firestorm comic vol. IV, Futures End, Interview, News, Podcast. It’s great to hear from Jurgens here again, and the Bloodwynd talk was an added bonus! One of these days, I’d love to hear about that character’s creative origins and more elaboration on Jurgens’ intentions, but quite frankly, I think he already took up far more air time than I could justify from the Firestorm/Aquaman audience. It’s worth noting that in Jurgens’ famous funeral procession poster, Aquaman was one of the six pallbearers (with that little Atom-hole adding weight to it.) Robin was the only non-JLA founder holding a rail, while Martian Manhunter merely looked on, and Firestorm was off somewhere drinking the pain away. One of the things I hate about the New 52 is the lack of precedent. It made sense for scores of super-people to turn up in the face of a genocidal World War, but not so much the recession of 2008. So long as the JSA were the first team, and the JLA was the greatest, you could plug a Justice Experience in between. I could handle a loose unnamed collective of superheroes that predated the JLA, but once you dub them “The Others,” it’s a problem. Aquaman starts bragging about forming the first super-team, then Superman chimes in with some bogus line-up he pulled together seven years ago involving Steel and… uh… Gangbuster? Then Batman points out that he was secretly running three Robins simultaneously, effectively creating a team eight years ago, and one of them co-founded the first Teen Titans with Cyborg two years before the JLA existed… it never ends. At least the Others are oddball enough to make them more interesting than most of their Tron-uniformed contemporaries. I’m late to the party on this one, I was in China for work the week this episode came out and am just now getting to it. Always good to hear from Mr. Jurgens. I unfortunately won’t be able to make it to SpringCon in St. Paul this year to visit with him, so good to hear from him again in this interview. It’s a bit gut wrenching to hear all of the great plans Dan had for Firestorm and know that those won’t ever come to fruition. We really got screwed when DC cancelled that book. I hate hearing that there continues to be last minute editorial changes at DC between the time books are solicited to the time they see print. I think that from those creators who have come forward (George Perez, Paul Jenkins, Rob Liefeld, etc.) on the subject, that it is evident that many of the plot holes and inconsistencies that have riddled the New 52 are the result of these last minute changes. It’d be nice if DC editorial could stop running their books this way and let the writers, you know, WRITE the stories that they originally submitted and were initially approved. Future’s End with regards to Firestorm sounds great. That’s a very interesting approach to see Firestorm 5 years from now, and the changes in view point and development that could occur during that time between Jason and Ronnie. It’s good to hear Dan so enthusiasitic about this book, that’s very encouraging, and you can’t help but feel the energy and get the excitement for the title as well. Very funny Lightning Round. Love Dan’s insight on Shakira’s creation from Grell. Great question Shag! The whole round had some great questions! Thank you for this interview guys, I have found myself very apathetic in general towards the DCU, this interview has gotten me excited again for some of the books in the DCU, I can’t wait to see what directions these titles head in!